Santorini’s Red Beach is formed and earns it name from the iron-rich sedimentary rocks in the cliff face and the reddish sand that you can lay on. The red beach is by far the most popular beach on Santorini due to its unique colour. It’s definitely worth the bus ride down from Thira and then either a small hike or water taxi just to view it with your eyes, even if you do opt to lie on another beach a little further along that coast they may be less crowded. If I recall correctly the bus to Akrotiri (Red Beach) from Thira (the main town on the island) cost around €1.80 one-way. However, it does not drop you off right at the beach, so be aware of that when you get off that you know where you’re going! I’d personally recommend taking the 10 minute walk over the hill rather than the rather expensive boat taxi which costs €5 for what is essentially less than a 5 minute ride (although it does include return on the boat back). There are a few black beaches on Santorini, but I personally recommend the one at Perissa. It’s quite large and there is a lot of space for people to lie out so it doesn’t feel crowded even when there is a lot of people. The Perissa area also has a lot of cheap hostels, hotels, bars and restaurants nearby too, so if you base yourself in one of those places along the main street in Perissa you’ll only be a 5 minute walk from the beach every day. That’s not to mention all the cool little beach bars that you have access too which are not really possible on the Red Beach due to the cliff side. The black volcanic sands and fresh blue water are also an added benefit of visiting this beach. Of all the beaches on Santorini, I definitely thought the white beach was the most beautiful. It was also the most under rated! You can only access the white beach by boat as there is no walkway. You simply take the same bus as you would to the Red Beach, getting off at the same stop. The easiest way from there if you don’t have your own boat is to jump on the water taxi. It’s the next stop after the Red Beach. The pure white cliffs behind you are truly stunning, plus it’s harder to get to location means there is usually less people on the white beach. Only downside is it is a pebble beach rather than sand, but you definitely shouldn’t leave Santorini without at least viewing this beach from the boat. It really is beautiful. 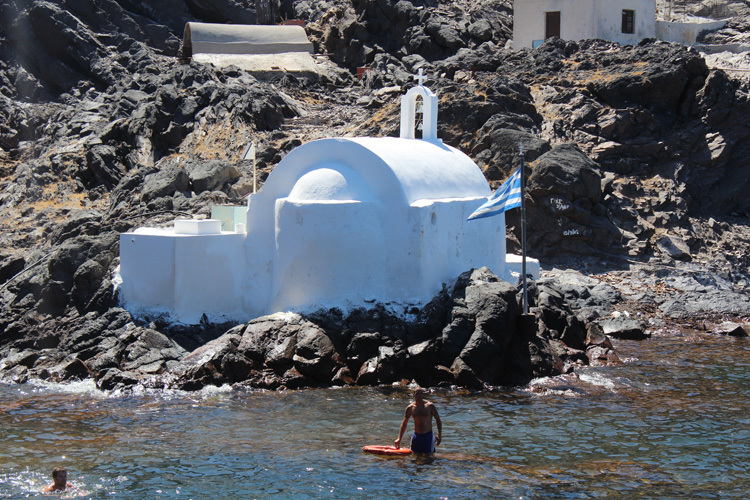 All the boat trips that take you out to the volcano in Santorini also take you to the hot springs. Spoiler alert; unfortunately the hot springs are not actually hot. They would only be if the volcano was active, which it is not, however it is a really beautiful place to visit and go for a swim. You’ll also see a beautiful little church perked next to it on the rocks that you’ve probably seen in many post cards already but can now get to see in real life. Santorini has many beautiful sights around the island to have you hopping around quite easily for a full week taking it all in. With it’s beauty and beaches it is also a very popular destination with couples. I met at least 5 couples on the island who had got engaged while they were there!! So no pressure guys!! If you’re looking for that romantic break away with your partner, or like me, you’re just interested in the geology, sights, and culture that Santorini has to offer, then you may want to consider booking with Directline Holidays at http://www.directline-holidays.co.uk who are currently offering cheap deals to the island. – If you liked this article you may also be interested in reading about my first impressions of Ios. Great picture Jane! I haven’t been to Santorini yet but I will definitely go now! Ahhhh Santorini Greece…what a great place! I went here after graduating college and fell in love. I’d have to agree that Red Beach has got to be on everyone’s itinerary! OMG I totally love Santorini. I loved the volcano and the seas are soooo beautifully blue! I think it’s the perfect retirement spot. I remember my friend spent her entire budget on trinkety things in the wee shops there. It felt like a smart decision at the time! I’ve always dreamed of going to Santorini, but haven’t made it there…yet. Thanks for this information. I’m greatly interested in the history and geology of the area and I think your tips will be very helpful when I do plan my Santorini holiday!